KUALA LUMPUR: National sprint king Khairul Hafiz Jantan smashed the 49-year-old National 200m record set by the 'Flying Doctor' Tan Sri Dr Mani Jegathesan in 1968, the oldest record in the Malaysian Athletics record book, with a blistering run of 20.90s to win the event at the 94th Malaysian Open Athletics Championships here tonight. The 18-year-old sprinter from Melaka who had last year erased the 100m record held by Watson Nyambek, set a blistering pace at the National Stadium in Bukit Jalil to rewrite the 20.92s old record set by Dr. M Jegathesan at the 1968 Mexico Olympics. His time was also a new meet record, beating the old mark of 20.94s set by Kento Terada from Japan in the 1996 edition held in Kangar, Perlis. Sarawak's Jonathan Nyepa took the silver with a time of 21.29s while Perak's G. Aravinn Thevar clocked 21.31s to take the bronze in the meet that will serve as a Pre-SEA Games championships. Speaking to reporters later, Khairul said he would now focus on winning the 100m and 200m sprints at the SEA Games, that would be incidentally held at the same venue. "All praise to God for giving me the strength to break the National record. I wish to thank my parents and coach Mohd Poad Md Kassim for their support. 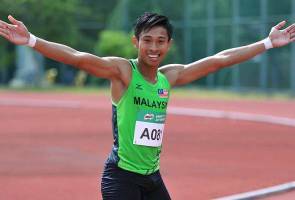 This will give me extra confidence to do well in the SEA Games next month," he said. In the women's 200m, National sprinter Zaidatul Husniah Zulkifli representing Penang, clocked 24.12s to win the gold medal, beating S. Komalam Shally from Terengganu (24.27s) and Siti Fatimah Mohamed from Johor (24.58s). In the men's 110m hurdles, Clinton Kingsley Bautista from the Philippines swept the gold after clocking 14.16s while Ang Chen Xiang (14.64s) from Singapore took the silver and Mohd Rizzua Hizad Muhammad (14,91s) was the bronze medal winner. In the women's 100m hurdles, National runner Raja Nursheena Raja Azhar representing Terengganu won the gold with a time of 14.44s, ahead of Nur Syafiqah Abu Bakar (14.95s) from Johor and Juriani Mat Rodzi (16.22s) from Perak.